THE BMW Z4. BOLD AND SPORTY. A TRUE LEADER. Complimenting this impressive performance is firm suspension, a short-wheel base and even weight distribution, which provides superior handling and tremendous agility – a perfect combination for any genuine sports car. Standard equipment in replacement or addition to Sport Model. Standard equipment in replacement or addition to M Sport Model. 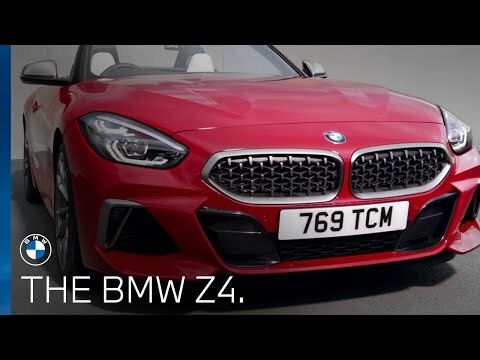 THE BMW Z4 IN MORE DETAIL. Make a statement with the stiking San Francisco Red Paint 18" alloy wheels. The latest generation of BMW Z4 is made to blend into the crowd. The recognisable new Honeycomb grille and stunning soft-top roof combined draw attention on any road. The soft-top roof can unfold at up to 31mph in just 10 seconds. Add this to the useful electric folding mirrors, it has never been so easy to make a lasting impression. In the interior of the all-new BMW Z4, minimalism meets eccentricity. Ambient Lighting boost the modern feel with six different colour options available to customise the mood of the cabin. With the most up to date BMW Technology added to this classic model, the driver will benefit from the use of the Digital Cockpit Professional and Professional Multimedia system to make for an enhanced driving experience. The new BMW Z4 stands 13mm taller, 85mm longer and 74mm wider than it's predecessor. But with the shortened wheelbase and widened track, this model drives with a sharpened agility like never before.